What Were the Most Common Email Mistakes of 2017? How’s your email game? Are people happy to correspond with you, or are they leaving you hanging? The quality of your email communication can significantly impact how you’re perceived by others (especially in business). And though we all do our best to write like a boss, grammatical errors still creep in. Fortunately we can learn from our own (and others’) mistakes. So as the year wraps up, let’s take a moment to reflect on the fifteen most common email mistakes made by Grammarly users in 2017 and find out what we can all do to step up our email game in 2018. Sometimes we make spelling mistakes because it’s difficult to type on tiny touchscreen keyboards. Other times we’re just not sure how a word is spelled. Either way, misspelled words were by far the most common email error in 2017. Good thing Grammarly’s here to catch these pesky errors in your browser and on your iPhone. The runner up for most common error? Repeated words. I love watching movies, but going to the movie theater is very expensive. When I want to see a movie, I usually just rent one. Things can get tedious when you use the same words over and over and over. . . Energize your writing by employing synonyms instead of the same word repeatedly. Struggling to think of an alternative word? Do a quick thesaurus search for inspiration! Even a simple change such as “We had a lovely meal” instead of “We had a nice meal” can make a big difference. Use these nine easy tips to improve bland writing. Misspelling a place name can be embarrassing (it’s “Albuquerque” not “Albaquerque”). Misspelling the name of a hiring manager or potential client can be horrifying (it’s “Kathryn” not “Katharine,” but you didn’t care enough to figure that out). Always do your due diligence to make sure you have the correct spelling. And, just in case, here’s how to salvage your credibility after misspelling someone’s name. We’ve grown so used to the informality of texting that it can be easy to forget most emails (especially for work communication) still require proper capitalization and punctuation. You can grab a quick refresher on capitalization rules here. In most situations, using the active voice in lieu of the passive voice will bring greater energy and clarity to your writing.
. . . But occasionally the passive voice is the more appropriate choice. Not sure how to identify the passive voice or when it’s okay to use? Here’s everything you need to know about using the passive voice correctly. Some of us overuse commas, and some don’t use them enough. Commas can greatly affect the meaning of a sentence, so mastering their use is a worthwhile skill. Here’s a refresher on common rules of usage and how to use commas in complex sentences. While a period (full stop) used in a text message can imply anger or harshness, this is not the case with email. Keep your credibility (and make your meaning clear) by punctuating the end of your sentences. Period. Knowing which words to capitalize can be confusing! I’ve been a copywriter for several years and I still double check capitalization rules. Get clear on proper nouns and how to use them with this quick guide. Are your sentences full of hot air? Phrases like “as a matter of fact,” “in a manner of speaking,” “clearly,” and “generally” may seem polished, but they’re unnecessary and end up cluttering your writing. Streamline your writing by cutting out these thirty-one words and phrases you no longer need. Did you know it’s not always appropriate to use a numeral (1, 15, 5,000)? Sometimes the correct route is to spell a number out (one, fifteen, five thousand). Here’s a quick guide for when to spell numbers and when to use numerals. Sansa and her sister Arya often fought as children, which was difficult for her. In the example sentence it’s unclear which sister found their quarrels difficult. Keep your writing crystal clear by clarifying which antecedent (Sansa or Arya) the pronoun (her) refers to. Want to learn more? Check out the basics of antecedents here. She forgot to use a conjunction, the sentence was incorrect. A comma splice occurs when you join two independent clauses with a comma and no conjunction. Here are some examples of common comma splices to watch out for, plus how to fix them. As Joanna reviewed her Weekly Writing Update she realized her lack of comma use. Unfortunately, this is often the top error listed in my Grammarly Writing Update each week. Don’t make the same mistakes as me. Learn how to properly use commas with introductory clauses. Is verbosity hurting your writing? Overly long sentences may confuse and bore your audience. You can improve readability and clarity by streamlining your writing or breaking your mondo sentences into multiple sentences. 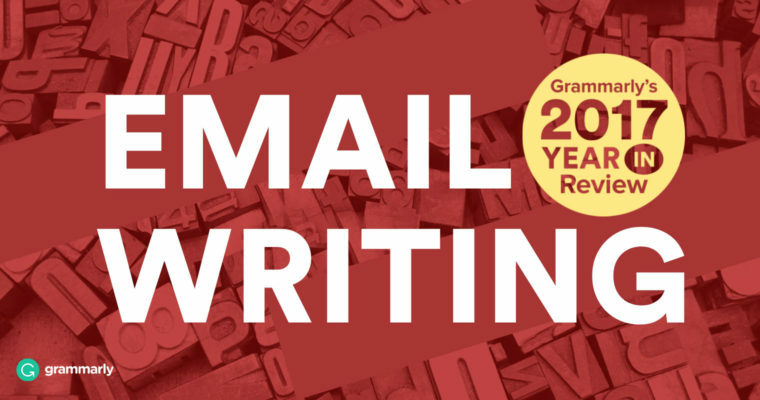 Check out these great tips for cleaning up your dirty writing, getting to the point in everything you write, and purging unnecessary words from your emails. What will you do to uplevel your email communication in 2018?